Taps will run dry in the South African metropolis of Cape Town in two months. Hundreds of cities across the world are nearing a similar breakdown. Can they avoid a collapse? The water conservation maxim, “If it’s brown flush it down, if it’s yellow let it mellow,” adorns the walls of hotel rooms in Cape Town, one of South Africa’s richest cities. Its implication becomes clear as one enters Springs Way, the road leading to the city’s most popular natural springs. Here, “ubers” or flatbed trolleys that are used to haul water cans to waiting cars can be seen everywhere. 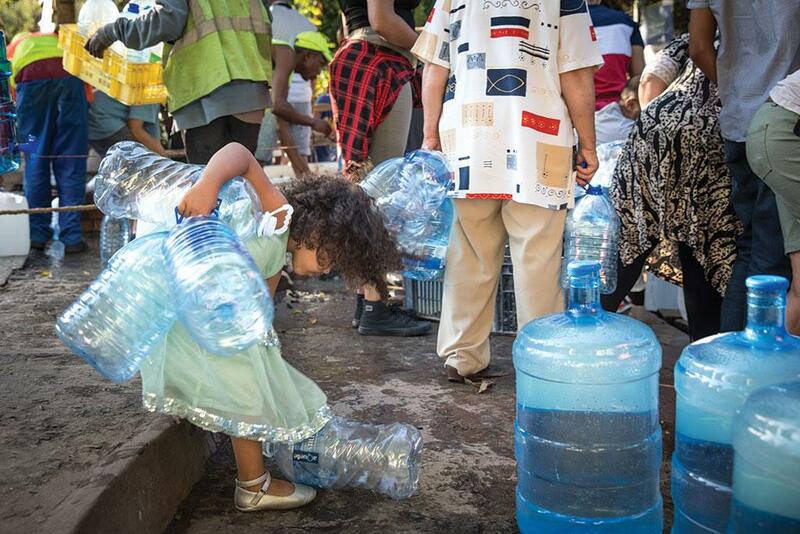 Under the watchful eyes of the local law enforcement authority stationed on the streets, people jostle for space around a three-inch PVC pipe at a spring water collection point in their mad rush to fill bottles, buckets and jerrycans. The precious water flowing out of the numerous pipe holes has become the city’s lifeline as a dry and waterless future stares at the city’s residents. There are already strict restrictions in place to budget water. The municipality has introduced skyrocketing tariffs and penalties if water usage exceeds 6,000 litres per household per month (50 litres per person per day). Last year in September, the limit stood at 87 litres per person per day. Once an idyllic street located in the upper middle-class suburb of Newlands, Springs Way has turned into a crowded place ever since Cape Town realised it was running dry. “We have been coming here almost every day to supplement the 50 litres of water per person we get from the municipal pipes,” says Louise, a Cape Town resident. Though there is no limit as to how much water one can collect from the spring, a daily limit of 25 litres per person is likely to be imposed when Day Zero hits on July 15, 2018, and the municipal taps run dry. (Update: After this story was published, the Cape Town officials deferred the Day Zero to 2019, despite the fact that there has not been any improvement in water level in the reservoirs). When that sets in, residents will have to queue up to get water ration from collection points under armed guards. Twenty-five litres is a pitiable amount. A toilet flush generally uses about 9 litres of water. However, the day of ration does not seem far, with most Capetonians still not adhering to the new limit. Day Zero will hit when the levels in all the six dams drop to 13 per cent. And while the restriction of 25 litres is aimed at conserving water, it has also made people anxious. It is not clear how the limit can be enforced and order maintained at the same time. There are palpable signs of anxiety everywhere. Posters, hoardings and stickers adorn airport pillars and electric billboards, urging residents to conserve water. So how did this happen to a city that bagged the C40 Cities Awards in 2015 for its Water Conservation and Water Demand Management Programme? Climate change is one of the most potent factors. Cape Town relies on rainwater to fill up its six reservoirs, and below average rainfall from 2015-17 has contributed to the drying up of the reservoirs. In fact, the Western Cape region where Cape Town is situated has been undergoing a massive drying up process since 2015. Fuelled by El Niño between 2014 and 2017, the southern as well as the eastern African regions, including parts of South Africa, Zimbabwe, Malawi, Rwanda, Madagascar, Mozambique, Botswana, Zambia, Somalia, Djibouti, Ethiopia, Kenya and Uganda, have witnessed some of the driest conditions. Above normal rainfall in 2017 finally brought some respite to these countries, but the southernmost tip of Africa was not so fortunate. In fact, Cape Town may face drought this year too. Western Cape and its neighbouring provinces receive rainfall mostly during April-September due to cold fronts, that occur when a large mass of cold air meets a mass of warm air to regulate rainfall activity over the southernmost tip of Africa. When they meet, the warmer air is pushed upwards and results in the formation of cumulonimbus clouds that bring rains and thunderstorms. But predicting cold fronts is difficult. According to government–run South African Weather Service (SAWS), the high variability of eastward winds coming in from the Antarctic Ocean, which lead to the formation of cold fronts, makes rainfall forecast in the region a difficult proposition. According to Piotr Wolski, a climate researcher at the University of Cape Town who has studied the historical rainfall data, the 2017 drought is a rare event with the probability of its occurrence just once in 36 years. 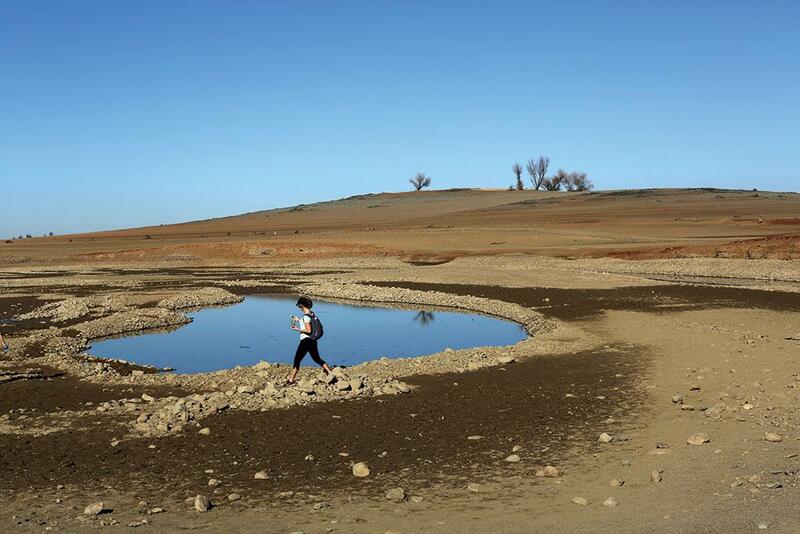 “The sheer improbability of the drought is remarkable even though the three-year period is undoubtedly the driest on record. 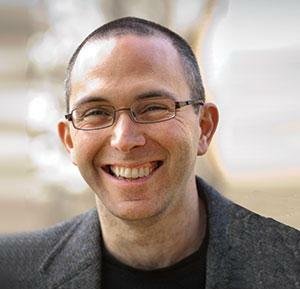 My findings are that this kind of drought occurs once in 311 years, with a 90 per cent chance that it falls between or comes once in 105 and 1,280 years,” he notes in an analysis on the university webpage. As per SAWS, Cape Town receives 820 millimetres (mm) of rain annually, of which 77 per cent is received during the winter and the rest during the summer. According to the average rainfall, the region is semi-arid, but even by these standards, the past three years have been particularly harsh, including two of the driest years since records started being maintained in 1921. While the region received 549 mm of rain in 2015, the number stood at 634 mm in 2016. In 2017, it was 499 mm. Also, the latest drought does not mean rainfall has been consistently failing. In fact, one of the characteristic features of the rainfall here is its high variability from year to year. A rainfall of 1,211 mm in 2013 in Cape Town was the sixth highest-ever recorded while 853 mm received in 2014 was also above average. Rainfall projections for this century show a declining trend across southern Africa, with stronger and frequent droughts expected in the coming decades, exacerbated by climate change. According to Wolski, the average rainfall trends of the past 84 years in Western Cape show precipitation has been declining at the rate of over 17 mm per decade. However, precipitation alone cannot be blamed for the severity of the situation. One also has to take into account the city’s water supply system. 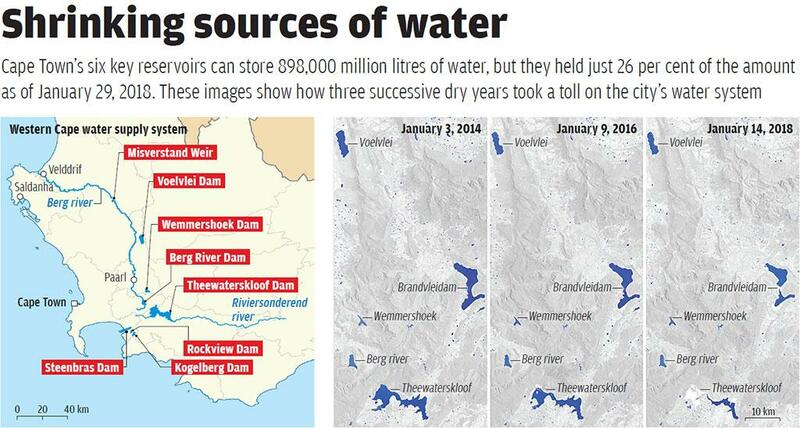 In 2014, all the six reservoirs that supply water to Cape Town were full. 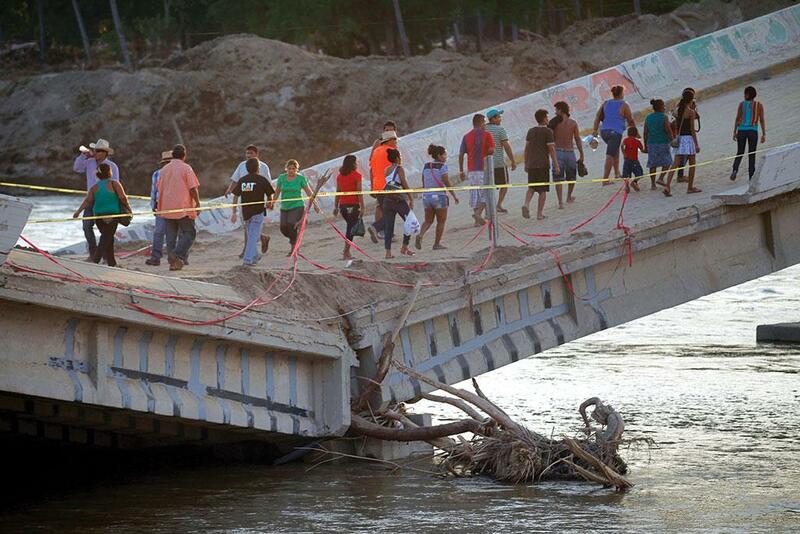 It took just three rainfall-deficient seasons to push the city to its worst crisis ever. When Down To Earth (DTE) visited Theewaterskloof—the largest reservoir in Western Cape and the main source of water for Cape Town—in the beginning of March, it was just over 10 per cent full. The site resembled a 500-sq-km apocalyptic dust bowl, with stumps of trees on what used to be the bed of the reservoir and a narrow stream flowing as the only reminder one of a fast desertifying future. Four years ago around the same time of the year, the massive earthen reservoir, built on Sonderend river, was over 80 per cent full. The effect of the ongoing drought on agriculture, which mostly comprises orchard farming, is palpable. There is less fruit picking in the apple, pear and other orchards in Western Cape, a lot of which depends on water from the reservoir. Its drying up has led to around 20 per cent less produce. After rains failed last year, several farmers cut down on sowing new plant seeds and the impact is becoming visible as the region begins its harvest season. In February, the latest drought in Western, Northern and Eastern Cape was declared a national emergency by the South Africa government. Recently, the provincial minister for economic opportunities, Alan Winde, citing a report by the agricultural department and the Bureau for Food and Agricultural Policy (BFAP), said the drought is likely to cost the sector a staggering US $500 million. Agriculture together with agri-processing contributes over 10 per cent of the Western Cape economy and forms over half its exports. It also employs over 300,000 workers or 15 per cent of the total regional workforce, three-fourths of whom are seasonal migrant farm workers whose three months of work typically provides for the entire year. They work for farmers, most of whom are big and own a lot of land. With the total water level in dams across Western Cape teetering just above 20 per cent compared to 32 per cent last year, farmers in some areas have to deal with water cuts as high as 86 per cent for irrigation. Farmers who own borewells can use them only twice a week for limited hours. Albert Lingenfelder’s farm is adjacent to the dam. He and his two brothers are third generation farmers who depended on the dam to irrigate their 200-hectare apple and pear orchard. “In my 23 years of experience, I have never seen a situation like this. We had to cut down our water use to the bare minimum. I have prioritised the plants that are ready for harvest and I am not irrigating the younger ones. To make matters worse, the dry and dusty conditions have massively increased the number of microscopic red spiders that feed on leaves and have a damaging effect on fruits,” says Lingenfelder. The loss in production is also leading to layoffs in the agro-allied sector. Statistics of South Africa’s year-on-year analysis of people employed in the sector from 2015-16 to 2017-18 shows a decline of over 32,000 jobs. Frequent protests by farm workers are also being reported from provinces near Cape Town. The shortfall in production this season has led to a 20 per cent reduction in the labour requirement that has affected workers mostly from the Eastern Cape. The Lingenfelders depend on seasonal farmers, mainly from the Eastern Cape, to pick fruits. In the Western Cape, BFAP policy brief notes that there has been a 20 per cent shortfall in production of its famous wine grapes, but employment has not been hit in a directly proportional manner. “There, however, has been a drastic reduction in the amount of water used to wash and prepare the grapes,” says Angelique Yunia, who supervises a team of 64 farm workers (40 of whom are seasonal) in a vineyard in the Stellenbosch region near Cape Town. In 2016, as many as 2.33 million households or 13.8 per cent were agricultural, according to the Community Survey of Agricultural Households conducted by Statistics South Africa. The number dropped from 2.88 million just five years due to droughts, says the survey. While much of the economic value of agriculture in South Africa comes from large-scale commercial farming, the survey found that over 80 per cent of the agricultural households in the country practice backyard or subsistence farming and depend on their farms for food. There are fears that the latest drought will add to this already stressed community which is increasingly abandoning the countryside and migrating to cities. A survey conducted in 2017 by BFAP warns that if it does not rain adequately, about six per cent farmers are expected to quit the trade which could further cascade into an employment and food security crisis. Lingenfelder, who is now planning to build a farm pond at a cost of $600,000 to avoid dependence on city water, admits the expense is “like a gamble”. “It will amount to nothing if it doesn’t rain,” he says. Across the region, hope is now pinned on the coming winters. Not just farmers, the ongoing crisis has impacted everybody in the deeply unequal city, that has mansions, resorts and shantytowns alike. But how the people are coping with the water crisis depends on how much money they have. For the rich, the current crisis means spending more to dig fresh, deeper borewells and also embracing water-saving technologies. Stephanie Peters of Hout Bay, one of the most affluent areas, spent over $2,200 last year to reduce her water footprint. She has retrofitted her house with water-efficient technologies like rainwater harvesting, grey water system for gardening and air-diffusing taps which reduce water use by 80 per cent by mixing more air with the water. She takes pride in the backwash collection system installed for her private swimming pool that she claims saves 2,000 litres of water a month. For the poor, water restrictions and calls to reduce consumption by city authorities do not amount to much. Far from swimming pools, they rely on communal taps for their requirements. The desperation can be clearly seen in the Imizamo Yethu (which means Our Struggle) informal settlement, barely a few kilometres from Peter’s house, that was originally designed for 2,000 people but today houses close to 50,000. While the better-off residents of the settlement have illegally drawn private connections from communal taps, others struggle to get water. They gripe that even during the current crisis, a lot of water is being wasted in their localities due to leaking pipes and community toilets. “Almost every tap here has a leak. If you want to see real waste, you should see the toilets. We regularly have situations where the toilet is leaking for days and nobody comes to fix it. It is a sad situation. The people don’t have water at their homes yet they see it being wasted every day,” says Justice Onkwana, who has been living in the settlement for over a decade now. In his part of the settlement, there are nine toilets that cater to 3,500 people. There are fears among the poorer sections of Cape Town society that they will be affected disproportionately by water reduction measures taken by the city since they do not pay for water. While city authorities swear that restrictions will be the same for all, residents of Imizamo Yethu are hard-pressed to believe this. Locals say that while the city routinely cuts off supply to the area, the drop in water pressure has effectively cut off water for about half the settlement. Imizamo Yethu sprawls along one side of the famous Table Mountain and the reduction of pressure has meant that only the houses of the settlement that are in the upper reaches, and closer to the small reservoir the city stores water in, get water while the pressure is not enough to carry the water to the lower reaches. When DTE visited the settlement in early March, residents in the lower parts claimed that the unintended consequence of the city dropping water supply pressure had left communal taps and toilets dry for over three days. The crisis is also fuelling distrust between the rich and the poor. There is a growing perception among the rich that they are being forced to pay more for water because people in informal settlements waste it as they get it for free through community taps. However, government data suggests that informal settlements, that house more than 15 per cent of the city’s population, consume just four per cent of the city’s water. The poor, meanwhile, claim people with piped water connections from nearby areas have started using community taps. Residents of Sihyala (roughly translates to We Stay) informal settlement, which has just three community taps for 164 families, say people from surrounding neighbourhoods are now increasingly using their taps. “So, our water availability, which was already low, has gone down further,” says resident Ntombentsha Sister. Wyt Myoyo, another resident, says there have been altercations in the past few weeks and warns these may escalate if people from “the brick houses” try to use their water. As half the city pays for its water and the other half relies on free government supply, there’s no prize for guessing which group of Capetonians will be the first to suffer from any quantum cuts that the city decides to make in the run up to Day Zero. 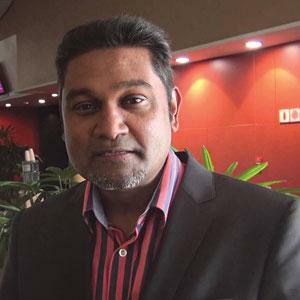 South Africa Water Research Commission’s chief executive officer, Dhesigan Naidoo, says one of the biggest reasons for the water crisis is the failure of planning and diversification. Cape Town relies almost entirely on water stored in dams for drinking purposes. The six dams with a total capacity of 898 million litres form over 99 per cent of the Western Cape Water Supply System—an interlinking of dams and canals—with some amount of water coming from springs originating in the Table Mountain. At this time four years ago, the dam levels stood at over 80 per cent cumulatively. The current levels are just 23 per cent. Apart from dependence on dams, high consumption pattern is also to be blamed. The city has recently been using about 500 million litres of water everyday, amounting to about 125 litres per person or 2.5 times the limit of 50 litres that the city administration has called for to avert disaster. Before the crisis, the number was as high as 900 million litres per day. Taking into account neighbouring municipalities and agricultural activity, for which around 30 per cent of the dam storage is usually reserved, the total consumption in the Western Cape region is beyond 1.5 billion litres daily. In the past 20 years, Cape Town’s population has expanded. In 1980, the city was home to 1.6 million residents. By 2011, it jumped by 230 per cent to touch 3.7 million. According to latest estimates, some 4.3 million people live here. In this period, the only addition to the city’s water supply system has been a 130-megalitre dam on the Berg river that started storing water in 2007. With the increase in population, the water requirement has increased. This is something that was not planned for despite the fact that the last water augmentation report was prepared between 2002 and 2005, well into the growth phase of the city, Naidoo says. “The augmentation report suggested that Cape Town would be water secure until 2022, but planners failed to take into account climatic and demographic changes. Resting on this estimate, the city has been slow to supplement its resources,” he says. A reading of the situation in the run-up to the crisis reflects the truth of Naidoo’s statement. While the country was warned of water shortages right through 2015 and 2016 and several other cities in Africa put in measures to manage their water resources, Cape Town was confident of good rains in 2017. Water conservation efforts were intensified only in September 2017 when it was clear that the rains had once again given the region a miss. “Until last year, the city was unable to pursue diversification of water sources as there was significant risk. If we received good winter rainfall, then the newly constructed infrastructure would become redundant. The city started the procurement process for augmentation or diversification as soon as there was a clear idea of what would be required to sustain itself through the winter of 2018,” says Alderman Ian Neilson, executive deputy mayor of Cape Town. It took another four months and the declaration of a looming Day Zero to bring the critical situation into focus. The local administration too needed this threat to swing into action. Along with regulatory mechanisms and awareness campaigns to conserve water, the city finally proceeded to initiate projects to augment water supply. Cape Town now has to reduce its overdependence on reservoirs, water planners say. According to plans, only about 64 per cent of the city’s water resources will come from dams in the future. For the rest of the supply, the city will have to turn to desalination of sea water, extraction of groundwater and promotion of recycled water. As part of a short-term plan, the city is working towards having a 16 MLD desalination plant in the next two months. Right now, four plants are being planned out of which the setting up of three is running behind schedule. The only one on schedule is a small one and will give only 2 MLD of water per day by March. When DTE visited one of plants in Standfontein, a worker informed that the plant is in the initial stages of being set up. “It is still uncertain as to when it will be up and running,” he said. “All the plants are being planned in the form of rented modular ones that will operate over the next two years until 2020. Significant pre-planning is also underway to allow for fast-tracked implementation of large-scale augmentation schemes in the long-term,” adds Nielson. As far as medium-term plans go, Cape Town is working to ramp up alternative water supply over 200 MLD before the winter of 2019, the bulk of which will come from aquifer extraction and desalination. Among all the plans for a water-secure future, the least controversial is recycling of water. According to local media organisation, GroundUp, private players in the city already recycle and sell about 50-100 MLD water to select customers. By June, Cape Town aims to introduce 20 MLD recycled water in the municipal water supply. As per long-term plans, the city intends to get over 150 MLD through recycling by 2021. Cape Town’s new augmentation plans state that up to 17 per cent of the city’s water requirement will be met by desalination by the early 2020s. But critics opine desalination cannot be the ultimate solution as the brine produced as a by-product will affect local ecology once dumped back into the sea. “This can increase salinity levels in the vicinity of the discharge. The city has applied for Coastal Water Discharge Permits (CWDP) for all its desalination plants. This requires that we assess the expected brine dispersion. Further, we will now implement a marine monitoring protocol as per the CWDP specifications,” Neilson says. The city hopes to tap aquifers for 10 per cent of water supply. There are three prominent ones—the Cape Flats Aquifer (CFAU), the Table Mountain Group Aquifer (TMG) and Atlantis. The latter already provides around 5 MLD to the city and plans are underway to extract up to 25 MLD by the end of the year. Authorities are also testing the viability of tapping into other aquifers. If all goes well, the city has the licence to extract up to 150 MLD within a few years out of which 80 MLD is expected to come from the TMG, 40 MLD from CFAU and the rest from Atlantis, the smallest of the three. But getting water from aquifers also has concerns such as possibilities of contamination, salt water intrusion and irreversible ecological damage. The city government has consulted geo-hydrology specialists in groundwater extraction targets who have carried out surveys that will help the city build a detailed model of aquifers that can be monitored after extraction. Aquifers are considered both for extraction and as natural underground water storage sites. As part of the city’s efforts to build resilience towards a water-secure future, officials are working on finding a sustainable balance between storage in dams and what exists underground. A major concern when it comes to groundwater is its unregulated extraction by private houses and businesses. “In the harbour area, it is more likely to raise environmental concerns. Large-scale borehole drilling has been quite carefully planned. However, there are chances of proliferation of smaller borewells, so there are likely to be some ecological consequences, especially if the next wet season is also a below normal one,” says Graham Jewitt, director of the Centre for Water Resources Research at the University of KwaZulu-Natal, Durban. Since Cape Town shocked its residents by announcing Day Zero, donation of the precious resource has helped the city move on amidst gloom. In a goodwill gesture, farmers owning large tracts of land donated about 10 million litres of water from their private reservoirs. While Day Zero has been pushed back till July, it does not mean the city is out of danger. “We need to pray for rains. It is going to take time to put in the necessary infrastructure to cope with a continuation of the drought,” Armitage says. Apart from Cape Town, what is the situation regarding the drought in the rest of South Africa? South Africa has been under drought conditions since 2014, or maybe even 2012. The country has seen drought episodes every 7-10 years for the past several decades but there has been a general amnesia around this. That being said, the latest episode has been particularly serious, not just in Cape Town or Western Cape, but in large parts of the country. In fact, many parts of the country have already run out of water. Towns like KwaZulu-Natal introduced restrictions way back in 2014, much earlier than Cape Town, whose size and affluence helped it cope much better than other municipalities. But since Cape Town is deeply connected with the Western world, it has received a disproportionate amount of attention. How has the drought impacted agriculture in the country? Agriculture and allied activities have been severely hit all over the country, especially in the last three years. But while production losses can be coped with by farmers in South Africa, who are generally wealthy, the most severe impact has been felt by those working on the farms. Most farm workers in South Africa are landless and their employment is seasonal and insecure. Successive years of drought have severely impacted this sector and fears are that it will ultimately destabilise the regional workforce. The drought has also affected subsistence farmers and the dipping productivity has had an impact on food security in the country. Traditionally a food exporter, South Africa has had to import food in 2016. If this continues, food prices could go up and complicate the problem. Is this now the 'new normal'? How can the farmers cope with the change? Rainfall patterns over the past 30 years suggest that we are in a declining trend. This could be a full shift to lower rainfalls or a shorter natural cycle. While it is too early to say for sure, but even optimistic global warming projections show at least a 2°C rise in South Africa in the coming decades, which means higher temperatures, lower rainfall and increased water stress. In that sense, it is the new normal. While it is worrying, it also offers us an opportunity to work with more water-efficient systems, especially in agriculture. We are working on changing the country's agricultural strategy to better suit the new normal. This would involve a change in cropping patterns, reliance on biotechnology and most importantly, a return to traditional dryland staples that used to be grown in these regions. 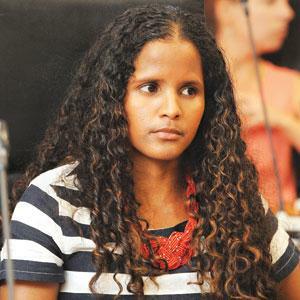 Cape Town is facing a lot of flak regarding the speed and timing of action. Is it justified? If we look at bulk water provision, it is the responsibility of the national government as per the constitution as well as the South Africa National Water Act. So, it is unfair to expect a local government to fulfill a role it is not mandated to carry out. Cape Town is responsible for distributing water to households and businesses, ensuring we treat water to match drinking standards and maintain water and sewerage structures. We do these well and outperform other municipalities. For example, our water loss rate is just 14 per cent, which is at par with international standards. Also, we are using mobile technology for leak detection. I believe our awareness programmes have gone a long way in reducing consumption over the past few years. Although Cape Town has the largest demand in the Western Cape Water Supply System (WCWSS), our consciousness about water consumption has helped us reduce demand. We even paid for the construction of a dam on the Berg river despite it being a national asset. We have readjusted our budget to implement water augmentation schemes. Do you fear that the present shortage will escalate into a class conflict? In a situation where there is the risk of scarcity of a critical resource, the response is to find someone to blame, firstly for perpetuating the crisis, and secondly for overutilising the resource. For this very reason, our usage information clearly stated that about 70 per cent of the water from WCWSS is consumed by residences: about 65 per cent of it goes to formal residential consumers and only 4-5 per cent is consumed by residents in informal settlements, who make up about 15 per cent of the total population. That is why our communication regarding water savings has been directed towards formal residents. I don't think there will be class conflict even if we have to face Day Zero, but we are planning for contingency measures. In case of Day Zero, water reticulation in formal residences will be shut off. People in informal settlements use communal taps for water and are in a precarious situation even during normalcy. I hope that instead of clashes, the current situation will lead to a greater understanding of the fact that many people have used little water over a long period of time. How do you address apprehension of residents living in informal settlements over restrictions? Our water savings measures have been implemented with consistency to ensure that no one is affected disproportionately. If we have Day Zero, we are working towards maximising access through an equitable placement of collection points and minimising all kinds of qualification documents. We are working towards increasing access to healthcare facilities and our priority is to ensure access to all citizens. Is there an estimate of how many borewells are being operated in the city and whether this is impacting groundwater? As part of our water restriction plan, we have asked residents to register their borewells. Till date, we have 23,000-odd registrations. This comes under the jurisdiction of the Department of Water and Sanitation (DWS), but the department does not have the capacity to carry out such a registration drive. So, we have included the requirement for registration and inspection so that we can start building a database of borewells. This will help us know which aquifers are being tapped into. We have also approached DWS to request for more stringent regulation on borewells and well points. The present rules are quite open-ended and lax, which lead to a misuse of water in the first place. The requirement for registration and inspection was announced in January this year. Limits have now been placed and incorporated into the current water restriction rules. We expect inspection to start this month. Is there any clarity on how Day Zero restrictions will be implemented? As of now 235 collection points have been planned and a layout design prepared. These points will be equipped with anywhere between 70-600 taps or standpipes that can be increased later. We will provide containers to people through which the water amount can be regulated. At this stage, we are making provisions for an individual to take a maximum of 100 litres based on a family size of four. For larger households, we will have to make special provisions. Consumption is still higher above the 450 million litres per day (MLD) the city aspires to reach. Has there been a shift in the consumption pattern? At present, dam levels are at about 23 per cent. Day Zero is expected to hit in mid-July which is well into our winter rainy period. One hopes that the rains this time will be sufficient for us to escape it. However, we still cannot predict the rainfall expected this season. There is a risk of consumption ticking up. Data shows consumption of 537 MLD, which is higher than the 516-520 MLD level that we have been practising for some time now. If this goes beyond 600 MLD, there is a risk of Day Zero being moved forward. But there is an understanding that water consumption levels need to be kept close to 500 MLD. People have built a stronger correlation between their consumption and Day Zero projections. Getting it to 450 MLD will avoid Day Zero situation even in the future. According to the national DWS, we need to keep our consumption at about 488.5 MLD, which is slightly higher right now. In the past few years we have reduced consumption from well over 1 billion litres per day to around 500 MLD. We are targeting high-consumption households by installing water demand management control devices. These help in regulating use and avoiding high consumption. We also have automated many of our pressure valves so that we can remotely reduce pressure. We have seen a reduction of about 50 million litres in consumption because of automation. Look, what we have done to the land of Maathai,” says Jamie, referring to the legendary Kenyan environmental activist Wangari Maathai who worked to save Nairobi’s Karura forest, and pointing at villas that have been built on forestland. Jamie, an Uber driver who lives in the Upper Hill district of Nairobi, says water is a prized commodity in the city. Much of the shortage is attributed to deficient rain and dwindling levels in reservoirs. “They have made huge profits by selling the villas, but can they buy rain with money?” asks Jamie . While Cape Town, South Africa, has been in the news for its water shortage, Nairobi has not got attention despite facing a water crisis since 2016. It was on December 26, 2016, that the Nairobi City Water and Sewerage Company Ltd (NCWSC) first announced “temporary” reduction of water supply, and the situation has only got worse. Currently, NCWSC is supplying 0.5-0.53 million cubic metres of water a day—less than 70 per cent of the total demand, which is 0.76 million cubic metres. Nairobi receives its water from four sources—Thika dam supplies 0.43 million cubic metres (m3) a day, Sasumua dam 52,800 m3, Ruiru dam 22,800 m3 and Kikuyu springs 4,000 m3. “The Thika dam, which supplies over 80 per cent of Nairobi’s water demand, is currently at 30-35 per cent of its holding capacity. The city usually receives rain for seven months—March-June and October-December—but since 2016, it has been receiving rain for only two-three months. We are forced to ration water through an equitable distribution programme,” says Maurice W Kihoro, a corporate affairs department official at NCWSC. However, there are doubts as to how “equitable” the water rationing programme is. Luke, a hairdresser, says that some neighbourhoods get continuous supply of water, while others only twice a week. Kihoro counters, “We give 24x7 water to three establishments—hospitals, airports and army barracks. Those houses that are linked to the same supply network get water throughout the week.” But even the reduced quantity of water is not reaching the homes of many Nairobians. The reason, as Kihoro explains, is the puncturing of supply pipes by people to steal water. Not only is the city losing water due to leakages, it is also causing revenue loss, he says. There is also a wide network of water cartels in Nairobi. According to a January 2018 investigation by Nairobi-based media house Soko Directory, 40 per cent of water cartels in Nairobi do not own any borehole but divert NCWSC pipes to fill their tankers and sell water at their own price. 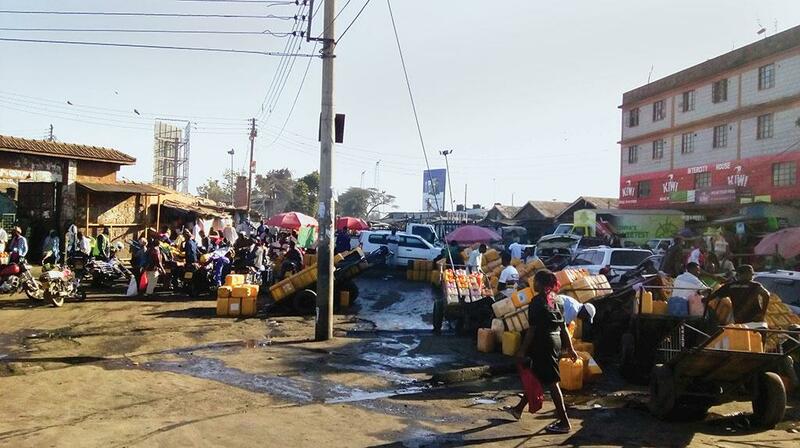 Most of the water channels in Pangani, Mlango Kubwa and Eastleigh districts in Nairobi have been either diverted or hijacked along the way by cartels. The situation is precarious in informal settlements where pipes are diverted by these vendors to create their own watering points. These cartels are draining Nairobians of their hard-earned money, especially the low-income groups. Benazir Omotto, an integrated urban environmental planning officer with the Umande Trust in Kibera slum, told Down To Earth that people living on less than 100 Kenyan shillings (KSh) a day (1 KSh equals R0.64) have to pay 20-40 KSh for 20 litres of water. This is 300 times costlier than the piped supply. “The water cartels are messing with the supply system,” says Kihoro. Some private water companies have got the licence from the government to dig boreholes and sell water, but there are people who circumvent laws and dig boreholes illegally, he adds. Last October, Nairobi Governor Mike Sonko announced that such cartels will be brought to book. “We are working with county governments to reign them in. Whenever we catch culprits, we deal with them appropriately by sentencing them to prison and penalising them with hefty fines,” claims Kihoro. On February 26, NCWSC declared that water rationing will continue till 2026, when construction of two more dams will be completed. Kihoro says the dams will have “twice the capacity of the Thika Dam, which holds about 70 million cubic metres at full storage”. So, will the shortage continue till 2026? Kihoro assures that the situation will improve when the Northern Water Collector Tunnel project is completed in December 2018. This tunnel will collect water from the Maragua, Gikigie and Irati rivers at their source in Aberdares, located north of Nairobi, and divert 0.14 million cubic metres of water a day to the Thika Dam for use in Nairobi. However, Ezekiel Muigai of the Kenya Meteorological Department, warns that worst is yet to come. “Large parts of Kenya, especially the eastern region, will experience depressed rainfall in the first three months of the rainy season (March-May 2018),” he says. According to Muigai, year-to-year variability in rainfall is huge, making droughts a common occurrence in the country. While the world’s most dramatic urban crisis unfolds in Africa, recent studies say at least 200 cities across the world are fast running out of water. An analysis by Down To Earth shows 10 of them are headed towards Day Zero—when the taps will run dry (see map ‘Global sinks’). This comes as a surprise because cities across the world have grown, thrived and expanded along rich, perennial sources of water, be it lakes, rivers, springs or even seas. So, where did all the water go? Robert McDonald, lead scientist at the US-based environmental group Nature Conservancy offers an explanation. “The main long-term driver of these shortages is the unprecedented urban growth occurring around the world,” he says. Rightly so. There has been a massive redistribution of populations in recent decades. Urban areas, which account for just 3 per cent of the total landmass, are now home to 54 per cent of the global population today, says a study published in Nature this January. The UN expects this rapid urbanisation will go on at least till the mid of 21st century. By then, urban populations would make up about 66 per cent of the world’s total population. Around 90 percent of this growth is expected to be in developing countries. “With growth in population come changes in land-use pattern, which can affect water availability in a city,” explains T V Ramachandra, professor of ecological engineering at the Indian Institute of Science (IISc), Bengaluru. For instance, he says, following Bengaluru’s rise as the information technology hub, built-up area of the city has increased from a mere 8 per cent in 1973 to 77 per cent now. A study by Ramachandra and his colleagues at IISc shows that the number of waterbodies like lakes has also reduced in Bengaluru by 79 per cent due to unplanned urbanisation and encroachment. This has severely restricted groundwater recharge. To make matters worse, the Bangalore Development Authority predicts that the city’s population might grow to reach 20.3 million by 2031. Beijing, the capital city of China, also faces a similar predicament. Though more than 200 rivers and streams can still be found on official maps of this arid city, they have all dried up. For the past three decades the city has survived by digging, boring and drilling for groundwater. Now hydrologists warn that groundwater too is running out. “Groundwater is depleting at a rate of 1 metre per year and becoming polluted,” says Scientist Lixia Wang of the Nanjing Institute of Environmental Sciences under the Ministry of Environmental Protection, Nanjing. Today, only 119 cubic metres of water is available per person per year in Beijing, says Wang. Anything less than 1,000 cubic metres per capita annually is considered “water scarce” by the UN. Overextraction of groundwater has already caused the city to sink up to 11 cm a year, shows a research led by Mi Chen of the College of Resources Environment and Tourism, Capital Normal University, Beijing. Experts say land subsidence can damage infrastructure like roads and bridges and increase the chances of flooding and earthquake. Half way across the globe, Mexico City’s experience is even more tragic story of urban growth. This largest metropolis in the Western Hemisphere is located in the Valley of Mexico where 700 years ago the Aztecs had built a city of floating gardens, known as “the Venice of the New World”. Over the years, the lakes that once filled the plains have been steadily drained by settlers. The lake beds now remain covered by a grey sea of concrete, tarmac and steel, forcing the city to source its supplies by pumping water from hundreds of metres underground or from a distance of over 100 kilometres. But these projects are taking a toll on the city. While overextraction of groundwater has caused the city’s soft base (heavily saturated clay) to sink at 40 cm per year, transporting billions of litres to the megalopolis at 2,400 metres above the sea level through seismically active mountains is fraught with danger. Then there are cities like Sanaa of Yemen, which after exploiting the last drops of groundwater are looking for alternative sources. The city is growing at 7 per cent a year. World Bank officials working on water projects in the Sanaa basin say groundwater level in the basin has fallen from 30 metres in the 1970s to around 150 metres in the 1990s. Media reports speculate that the city might reach Day Zero in 2019. To avert the crisis city authorities have started tapping fossil aquifers—deep pockets under rock layers where water has remained stored for millennia. Once tapped there is no way to replenish these aquifers. But the crises faced by Bengaluru, Beijing, Mexico City and Sanaa are not the making of sprawling urban areas alone. These are among the cities where urban planners have failed miserably to manage their water resources. Over the years, Bengaluru has become increasingly dependent on the Cauvery river for drinking water. In fact, in February while delivering a long-awaited verdict on the sharing of the Cauvery water between Karnataka and Tamil Nadu, the Supreme Court allocated around 6.5 thousand million cubic feet of water specifically for Karnataka’s capital Bengaluru. The court said that this was made keeping in mind the “global status of the city” and the demands of its burgeoning population. 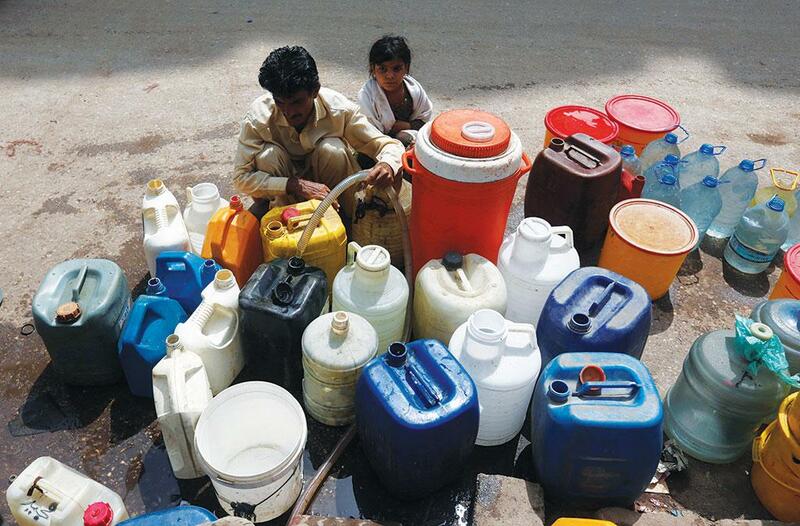 But analysts say the increased allocation will bring little relief to the city unless it manages the water well. The 2013-14 report of the Comptroller and Auditor General states that half of the Cauvery waters, supplied to Bengaluru between 2009 and 2013, was wasted either due to pilferage or leakage due to antiquated plumbing. Mexico City also loses 40 per cent of the water due to leakage, aged piping, lack of maintenance and illegal connections. Some estimates show that the lost water, if saved, could provide supply for up to 4 million people every day. Beijing’s water crisis is, however, the culmination short-sighted policies that have promoted overuse of limited water resources since 1949. This policy of guaranteeing water supply to the capital at little or no cost has wreaked havoc on Beijing’s farmers and encouraged wasteful consumption by industrial and urban consumers, says a 2008 report by Probe International, a Canadian public interest research group. 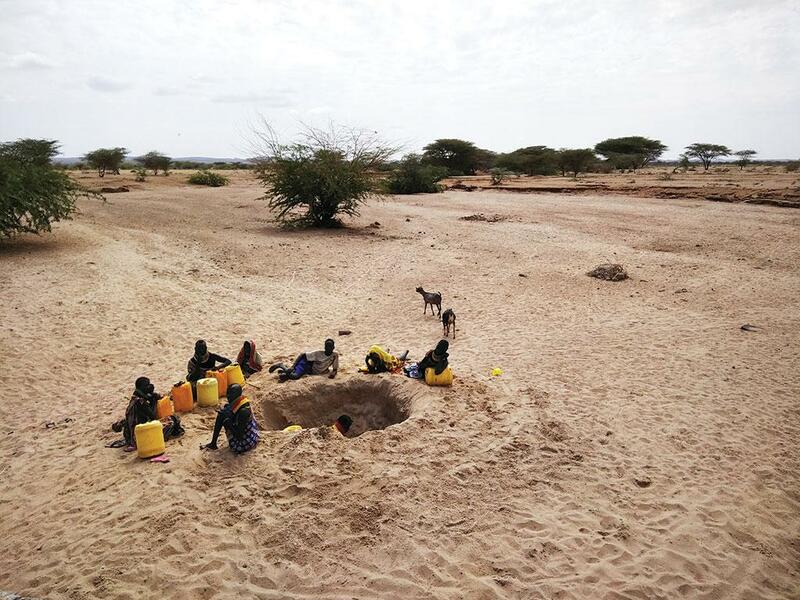 Eric Odada, professor of geology at the University of Nairobi and director of the African Collaborative Centre for Earth System, says lack of water governance is also at the helm of Nairobi’s long-standing crisis. The city is so heavily dependent on surface water that it plunges into a crisis whenever the monsoon plays truant. The water shortage became acute in 2016 because the city had not received adequate rainfall for four consecutive years. But heavy rains in April 2017 had caused severe floods. Ideally, this should have ended the city’s water woes. Instead, people continue to queue up for water in several localities. “This situation would not have arrived had the government harvested the excess floodwater,” says Odada. The other major problem is inadequate water supply network. About 75 per cent of the Nairobians buy water from the kiosks and pushcart vendors at a higher price—up to 300 times the supply rate—because they are either not covered under the city’s water supply system or do not receive adequate supply (see ‘Running out’). The problems of Istanbul, the most populous city in Turkey, are quite similar to that of Nairobi. In 2014 and 2015, Istanbul faced severe droughts. Water in the reservoir dipped down enormously in 2014 and in January it was just enough for 100 days, show official records. The city authority had to plan for transport of water from other basins. The city got relief in 2016 after a smattering of rain and the reservoirs filled to 85 per cent of the capacity. 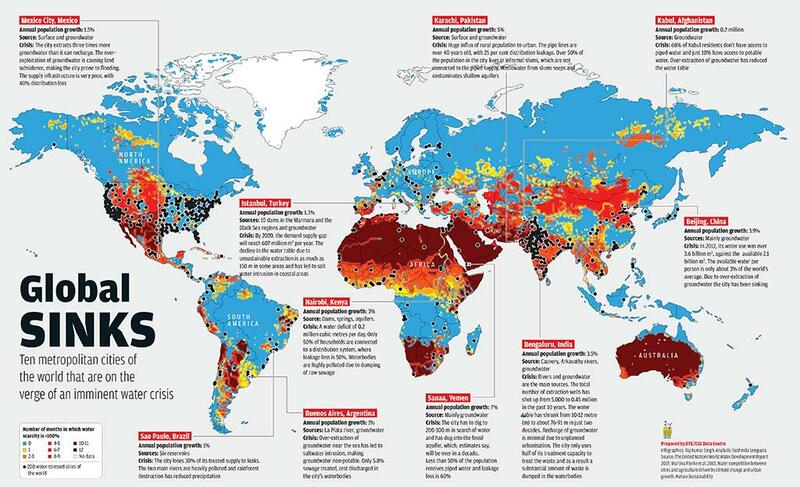 However, poor planning has again put Istanbul in the list of water scarce cities. The decline in the water table due to unsustainable extraction ranges from 30-150 metres in some areas. By 2020, the demand-supply gap will reach 607 million cubic metres per year, says a study published in the journal Environment, Development and Sustainability in 2015. Heavy dependence on surface water is also the reason São Paulo, one of the 10 largest metropolitan cities in the world, faces water crisis. The city depends on six reservoirs on the Tietê river and its tributary for water supply. But this also makes it vulnerable to precipitation anomalies. 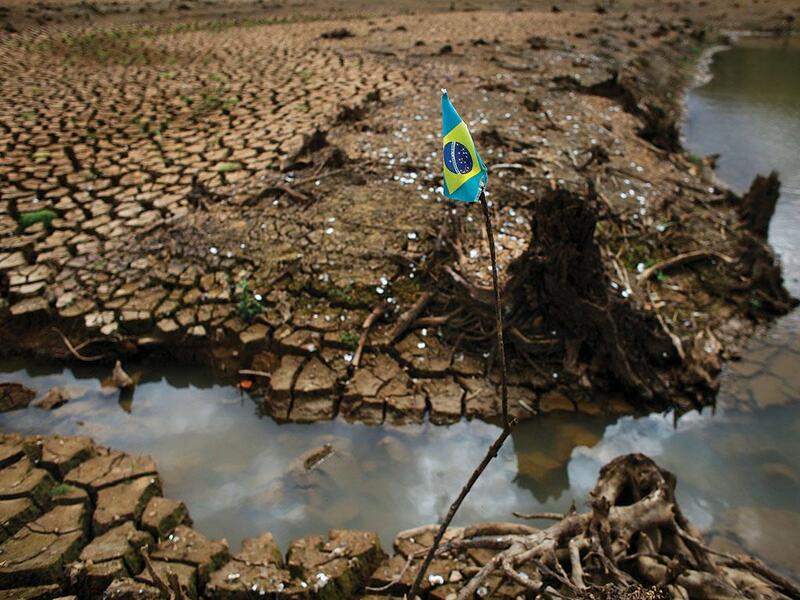 In 2015, the Brazilian city experienced its greatest water crisis in over 80 years after rainfall was below-average for two consecutive years. As the authorities introduced a water rationing system, residents endured 12-hour water cutoffs daily; the licences that authorise businesses, agricultural enterprises and private entities to draw directly from rivers, reservoirs and artesian wells were also suspended. Brazilian scientists, including its water utility officials, claimed that large-scale felling of rainforests in the Amazon basin was a major cause of the drought; rainfall was half in 2014-15 when compared to the previous worst year. While analysts do not ignore the connection, they say it’s time the utilities diversified their water resources and plugged leakages. São Paulo loses almost 30 per cent of its treated supply due to leaks in the piping system. Dearth of water is not always the reason for water stress. In several cities people suffer due to lack of access to sufficient clean or potable water. Consider Karachi. This premier industrial and financial centre of Pakistan is also the country’s most populous city. Media reports say the Karachi Water and Sewerage Board (KWSB) barely meets 50 per cent of the city’s total requirement even as its population grows by 5 per cent per annum. Mahmood Ahmed of the Shahid Javed Burki Institute of Public Policy at NetSol, a non-profit in Lahore, says KWSB is infamous for its irregular and inequitable water supply. Though 60 per cent of the households are covered by KWSB network, all they receive is water at a low pressure and for a few hours. The 12 community points meant for informal settlements, catering to over 50 per cent of the city’s population, barely yield any water and people invariably resort to tanker mafias. The worsening water crisis resulted in civil unrest in the city in June 2016. But do the ones who receive assured water supply receive clean water? In 2011, the World Wide Fund for Nature (WWF) released a report “Big cities, big water, big challenges”, which says a big No. In Karachi, for instance, only 57 per cent of the households have proper sewerage systems. This means a large amount of raw sewage gets washed away into open drains, contaminating leaky pipes, shallow aquifers and the Lyari and Malir rivers that are the major water sources of the city. A 2007 report of the Asian Development Bank says Karachi dumps around 340 million cubic metres of wastewater into the Arabian Sea every day; the Lyari and Malir get polluted immensely. Small wonder, outbreaks of waterborne diseases are a regular feature in the city. Buenos Aires, the capital city of Argentina, has no reason to be water stressed. The Argentine city is crisscrossed by the La Plata river and dotted with waterbodies. But unchecked expansion of industrial units, including tanneries, along its shores has now made the river into a receptacle of heavy metal-laced industrial waste. Since the city has the capacity to treat only 5.3 per cent of its untreated sewage, most waterbodies remain choked with waste. Since 1940, the city has turned to groundwater to meet its growing industrial and private consumption demands. But over the years, effluents from industries and domestic sewage have contaminated groundwater. The WWF report says groundwater at several places is no longer potable. In cities like Kabul, however, conflicts are the reason people do not have access to adequate potable water. Bombings have destroyed a large section of supply networks and treatment facilities in this city, where only 20 per cent of the residents had access to treated water. While internal strife has hit water availability in Kabul, in several other cities, water has also resulted in more conflicts—both internal as well as trans-boundary. As Chennai struggles for water, there are instances where farmers from surrounding rural districts have been selling water meant for irrigation to the city to the detriment of neighbouring farmers. Now consider this. A city like Delhi depends on neighbouring Haryana and Uttar Pradesh for water. It gets 60 per cent of its water from Haryana alone. Last summer, the Delhi government approached the prime minister for help after Haryana released less water. The Delhi Jal Board officials said that if this continued the city would face a major crisis. 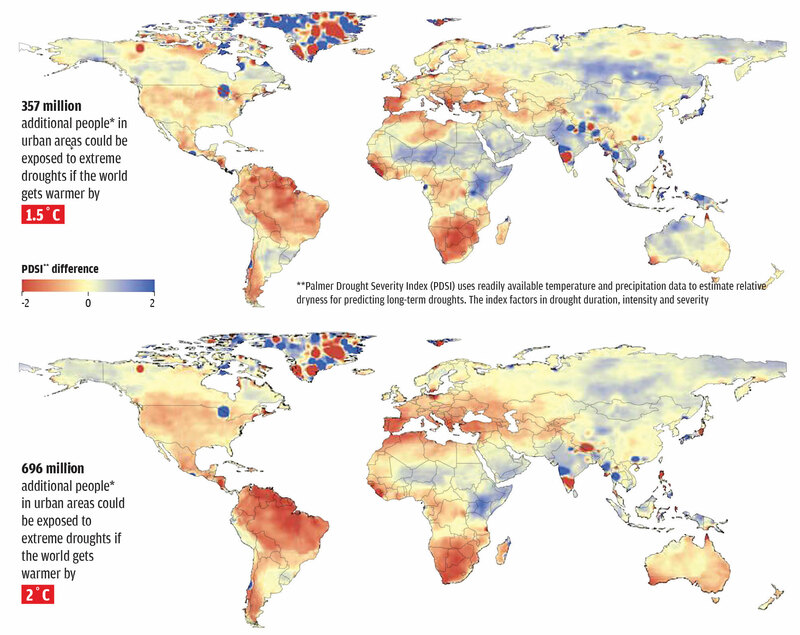 Such conflicts will become common as more than 27 per cent of cities across the world will have water demands that would exceed the surface-water availability, says a study by Nature Sustainability this January. The study analysed 482 world’s largest cities. Almost 19 per cent of cities, dependent on surface water transfers, have a high potential for conflict between the urban and agricultural sectors, since both sectors cannot obtain their estimated future water demands. McDonald, who is part of the study, says policymakers should make agricultural practices efficient to reduce rural-urban conflicts. But such conflicts would be just the tip of the iceberg in a changing climate. Are the governments equipped for an unforeseen future? We are living in what could be called the urban century,” says Robert Mc Donald, scientist at the US-based non-profit Nature Conservancy. Rightly so. More than 2 billion additional people, or one-quarter of the current global population, are expected to be in cities just three decades from now. They will all need water to drink, to bathe, to use the toilet, to wash their clothes and dishes, and for electricity, even as weather patterns become increasingly uncertain. Forecasts say urban water consumption might increase by 80 per cent by 2050. Growing abuse will further leave this seemingly infinite resource polluted and contaminated. As governments and water agencies scramble to avert their own Day Zero, they can turn to the ones who have quietly fought water stress through innovations and by integrating various urban water management strategies. Just before the debilitating millennium drought (which lasted 14 years from 1997) gripped large parts of Australia, the island continent had introduced the Water Efficiency Labelling and Standards Act of 2005. The law changed the water standard for washing machines, toilets, cooling towers, shower heads, taps as well as for industrial processes so that they do more with less. These standards also formed the basis of water-efficiency star ratings, much like energy-efficiency labelling that allows consumers to make an informed choice about the product. Today, manufacturers in Australia cannot make, and retailers cannot sell, for instance, toilets that have a higher flow rate than 5.5 litres per flush. These products helped many cities meet the water demand during the drought. Taking another step in this direction, it introduced incentives to motivate people to recycle grey water and harvest rain after the storage level of Lake Victoria got reduced to 26 per cent in 2009. It also launched the Water for the Future initiative, under which generous rebates were given to those who installed rainwater harvesting systems or grey water recycling systems, and rallied community support for lowering household water demand. Californian water agencies are now preparing a robust urban water management plan based on Australia’s experience to tide over the protracted drought. But blind aping may not work. “Every city is unique. So, for a sustainable water supply, there should be good coordination among the city’s regulators, urban planners and hydrologists,” says Partha Sarathi Datta, water and environment expert who was formerly the director of the Indian Agricultural Research Institute in Delhi. Planners understand the growth of cities, population, water demand and infrastructure, while hydrologists have the know-how to gauge changing rainfall pattern, surface and groundwater reserves and recharge potential of the city. Together, they can also help a city diversify its water resources and avert a Cape Town-like crisis. Water crisis took a toll on the African metropolis because the authorities depended on reservoirs as the sole source of water supply. So when the monsoon ditched the city for three consecutive years, they had to declare Day Zero. On the other hand, Singapore with no water resources has been able to meet its ever-growing water demand by tapping multiple sources! Surrounded by seawater, Singapore is almost half the size of Delhi. “We do not have aquifers or groundwater,” reads the website of its Ministry of Environment and Water Resources. Yet clean water flows at the turn of almost every tap in the city-state. This achievement has its genesis in the 1972 Water Master Plan, which outlined a diversified water resource portfolio to cover future water and development needs. Today, rainwater, imported water from Malaysia, recycled used water and desalinated water, together known as the four national taps, form a robust water supply system. The city harvests every drop of rain that falls on almost 65 per cent of its ground. A network of canals and drains, spanning 8,000 km, direct the harvested rainwater to reservoirs, where it is treated and made potable. The Public Utilities Board (PUB) also supplies high-quality treated wastewater, called NEWater, which meets 40 per cent of the water demand. To further bolster its water security, the nation has improved water loss through leakages from 9.5 per cent in 1990 to 5 per cent in 2016, one of the lowest rates in the world. Given that the city’s water demand is going to double by 2060, PUB is now busy expanding the rainwater catchment area to 90 per cent; the percentage of recycled grey water to 55 per cent; and reducing per capita water consumption from the current 143 litres to 140 litres by 2030. Necessity is the mother of invention, they say. 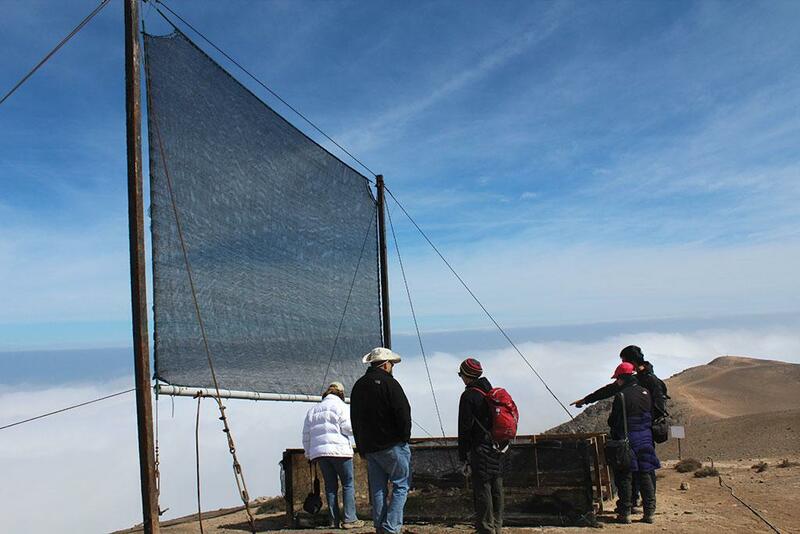 To solve the water woes of Lima, the second largest desert city after Cairo, a handful of scientists and a non-profit installed huge fog nets across its informal settlements in the early 2010s. Due to its proximity to the cool waters of the Pacific Ocean, the Peruvian city has an atmospheric humidity of 98 per cent. The fog nets, four-by-six-metre bamboo and metal frames draped with a thick mesh, trap humidity and convert it into water which flows through a bio-filter, hung underneath the net, and then gets collected in huge tanks. This provides water for free to the residents. But most coastal cities are relying on the controversial desalination for freshwater. Some 70 per cent of desalination plants in the world are located in driest cities like Kuwait, Abu Dhabi and Doha in West Asia. Analysts say these projects are not only costly but also harm the environment. “The brine discharge if not managed well can increase the total dissolved solids (TDS is a measure of water salinity) level of groundwater near sea, threatening fauna like turtles, shrimp and fish. This will affect the livelihood of fisherfolk,” says S Janakarajan, professor at the Madras Institute of Development Studies, Chennai. Researchers thus suggest cities should adopt the technology as the last resort. But these are just hollow words for those who are running out of freshwater. 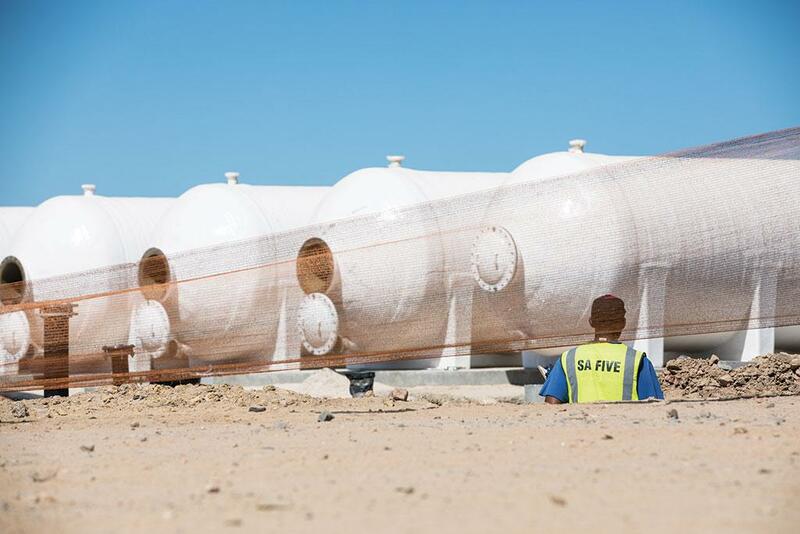 Cape Town, despite receiving ample winter rains, plans to set up desalination to tide over its worst drought in its history. Another popular method to compensate for deficient rains is cloud seeding. The technology involves seeding clouds with aerosols like silver iodide, and thereby improving chances of rainfall. While the UAE, Iran and Kuala Lumpur have been using this seven-decade-old technology to tide over water crisis, the success of the technology remains statistically unproven because once a cloud is seeded, there is no way to measure how much it would have rained or snowed had it been left unseeded. For long governments have also been mulling over river inter-linking projects as the sure shot panacea for the perennial water shortages in drought-stricken areas. While in most countries, it has remained a pipe dream due to concerns like changing the river morphology and affecting the surrounding ecosystems. But despite the concerns, India is all set to begin the project in interlinking the Ken with the Betwa in arid Bundelkhand region. China has already implemented a US $62 billion project to bring waters from its southern parts to quench the thirst of arid Beijing. “The goal is to ensure sustainable water supply. So, before employing any project we need to assess its impact on the ecosystem,” says Datta. In Excreta Matters, Delhi-based non-profit Centre for Science and Environment, states: “Water efficiency, harvesting rain, recycling and reusing wastewater are the best options followed in different parts of the world for a sustainable supply.” Blanca Jimenez-Cisneros, director of Unesco’s water sciences division, also advocates making the most of available water resources by reusing and recycling it (see interview on facing page). Urban areas will continue to expand. Global climatic changes will accelerate and worsen, especially if we delay the transition to clean energy. The sooner we accept these facts, the sooner every city can move to manage water in a more sustainable manner. 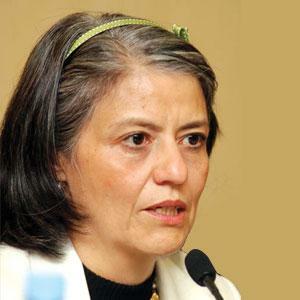 Blanca Jimnez-Cisneros, director of the division of water sciences and secretary of International Hydrological Programme, Unesco, talks to Sushmita Sengupta on how a huge cultural change is required to treat wastewater as a valuable resource. Excerpts from an interview. Do you think there will be more Cape Towns in the future? There is a risk that several cities will face water shortage as they are witnessing rapid urban population growth. One of the factors behind population expansion is rural migration. People come to cities looking for employment opportunities. When population expands rapidly, water and sanitation infrastructure suffers a vast deal. Moreover, there is the issue of weak or almost non-existent policies on more efficient water usage. Also, water management plans are not based on demand, reuse and recycling. Wastewater is often not given much importance. Which countries should immediately work on water management plans and practices to avoid stress? Countries which are not already water stressed at present, those located in arid and semi-arid zones; having high population density; and, nations in temperate regions where the per capita water consumption surpasses the local renewable water availability, are the most vulnerable ones. One has to consider the climate change models to further prioritise countries in need of sound, science-based policies and plans for water resources management. Why do you think cities should explore wastewater reuse at the policy level? It is simply because cities represent a tiny fraction of land (less than 1 per cent of the total available land) where water demand is extremely high. At the same time, they are the source of high volumes of wastewater. On the one hand, it results in an unbalanced demand, as cities are incapable of sustainably collecting the amount of water needed in the geographical area they cover. They need water for their needs further away from their location. On the other, cities discharge waste that the local environment is incapable of absorbing. Thus, it is imperative that wastewater is used to ensure sustainable water provision in a city setting and relieve the environment from a source of pollution. By promoting wastewater use, a key component of circular economy, we turn waste into a valuable source of water and contribute to sustainably closing the water cycle. The benefits of wastewater reuse are multiple and go beyond its use as potable water, that for agriculture and industrial purposes. Energy can be recovered in the wastewater treatment process and the sludge produced used as fertiliser post treatment. It is imperative to optimise the treatment stages and use wastewater for multiple purposes. I want to point out that the term wastewater reuse is not necessarily correct, as wastewater has to be used first in order to be reused. Most of the times, it is not the case. Which water-stressed urban areas have the maximum potential for reuse of treated wastewater? One has to aim for areas where there is high population density and where planners have made provision for green areas where wastewater can be used for irrigation. Also, there are cities where the infrastructure for wastewater treatment and reclamation do not exist, but can be constructed. This allows for proper design of the wastewater treatment process to optimise the results. In cities where wastewater treatment plants exist, other factors have to be taken into consideration such as the energy and infrastructure required to use wastewater. What should be considered while developing a legislative and regulatory framework for treatment and reuse of wastewater at the municipal level? The main thing is to consider wastewater as water source. We should move away from the concept that wastewater needs to be disposed of and embrace the idea that it consists of more than 99.99 per cent water. It is important that legislative and regulatory framework recognises and promotes multiple uses of wastewater according to demand. It should be clear to legislators that not all consumption demands the same quality of water. For example, drinking water has to have high quality while the water used to flush toilets may be of inferior quality. If wastewater is to be used for irrigating green areas or for agriculture, the quality demand is again different. Various industrial uses require different degrees of water quality standards. All these need to be considered, as it would allow for a flexible policy, resulting in the utilisation of the resource in a financially optimal manner. How can communities be made aware about treated wastewater and reuse? Reuse of wastewater requires a cultural change. People are taught from a very young age that wastewater is a waste. Though partly true (as a number of water-borne diseases are attributed to dirty water), wastewater is a resource. For recognising it as valuable, we need to mainstream water education in the school curricula and educate future generations to accept its use and reuse without any hesitation. Furthermore, we need to organise awareness programmes to target certain groups of users: farmers for sure as agriculture is a major guzzler of water. Which countries will achieve the Sustainable Development Goals if they include water conservation measures in their policies and actions? All countries where water is scarce and where they understand the importance of efficient water use (that is using six to eight litres of water to flush toilets instead of 20-30 litres). Also, those countries will achieve the goals that are reusing water; employing water for a different use from which wastewater is produced; or recycling. Though water is one of the Sustainable Development Goals (SDG 6) and is linked to a number of other SDG targets related to water, it would be a mistake to believe that water conservation measures and policies would suffice for member states to achieve all the goals by 2030. However, I agree that they would definitely provide countries with solutions and support in achieving a few of them, but not all.